It is with great sadness that we report that renowned yachting photographer Marc Paris was killed on a job in Turkey on Christmas Eve when the small aircraft that had taken him up for a photo shoot crashed. Marc's work can be seen in so many issues of Boat International and other publications. We all knew and will remember Marc for his absolute devotion to photography, which was his over-riding passion. We will remember Marc's incredible energy and passion for anything he started. He could deal with thousand projects at a time, and manage them all with the same enthusiasm. 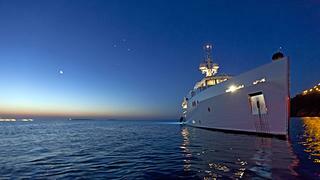 Founder of FabStudio in Nice, France, Marc (aged 57) was not only one of the best yacht photographers in the world, but also a unique and generous person. For Marc, sharing was essential. He shared not only his knowledge and skills, but also his values and his life experiences. To pay the tribute to his memory, FabStudio would like to finish one of his biggest and most important projects - the book "Super Yachts & Superb Crew". Later this month FabStudio will organise a day in the memory of Marc, and will be delighted to welcome Boat International readers to the studio (12 rue Bavastro, Nice). We will publish details about the exact day in due course. We will miss his enthusiasm for the next beautiful image, and his passion for boats and photography. Our heartfelt condolences go to his family and close ones.